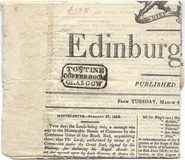 1823 Edinburgh Gazette showing on the front a very fine boxed TONTINE/COFFEE ROOM/GLASGOW, cachet in Black. 1871 Local Glasgow usage envelope showing GLASGOW COLLEGE crest on the reverse. 1856 Cover addressed to Manchester feranked by a 1d Red-Brown, SG 29, tied by a very fine Glasgow Experimental duplex with the so-called 'Madeleine Smith' cancellation in GREEN. 1856 Envelope to Lancaster franked by a 1d Red-Brown, SG 29, tied by a veryt fine Glasgow Experimental duplex - the so-called 'Madeleine Smith'. 1859 1d Rose-Red, SG 40, D-F, tied to Entire addressed to Edinburgh by a superb GLASGOW "POSTED SINCE 10 15 LAST NIGHT" DUPLEX. Very Scarce. 1856 1d Red-Brown, SG 29 tied to cover to Crieff by a very fine Glasgow Experimental duplex "so-called Madelaine Smith. 1872 ½d Violet Stationery card to Ashbourn (Derbyshire) cancelled by a superb GLASGOW-CARLISLE SORTING TENDER/159 duplex, Index 1, W 730. Superb. 1848 and 1850 Covers showing circular "GLASGOW/L" and circular GLASGOW without the 'L' Late Fee mark. 1859 Envelope to Paisley franked by a 1d Rose-Red, SG 40 tied by a GLASGOW 159 duplex, MS "Over½ oz" and Glasgow 'MORE TO PAY' applied. 1871 1d Rose-Red, SG 43, Plate 124 tied to Entire by a very fine GLASGOW-CARLISLE SORTING TENDER '159' duplex, INDEX 2, W730. 1872 1d Rose-Red, SG 43, Plate 129 tied to Entire by a very fine GLASGOW-CARLISLE SORTING TENDER '159' duplex, INDEX 1, W730.